I've heard so many blogs raving about this that the other day when I was in Sephora I decided to try it out. They usually have big packs for $9 CDN. I found this box of 60 sheets before the check out counter. They were for $5 CDN. I ended up buying a box for my sister and myself. The big pack says that it has around 100 sheets. The talk is that once you buy these you won't want to go back to drugstore cotton, and I have to agree these are super soft and I love them! They're made with 100% natural cotton. 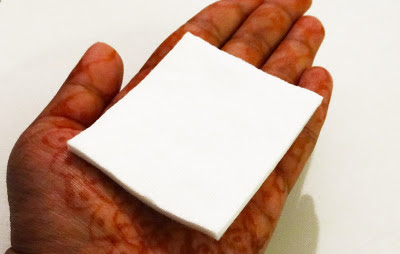 They're much thicker than other cotton pads and they don't shed. I've been using these to remove my nail polish and for my toner. They feel really soft, smooth and gentle on the skin. These cotton pads are a nice size, they about palm sized pads. I usually use half of this cotton pad since it's so thick that I don't need the whole thing. I'll definitely be repurchasing these. I love how soft and smooth they're. I won't be buying drugstore cotton pads these are so worth it and very affordable!